This cord receives DC power and converts it to 12 or 24 volt DC outputs. 6' Power Cord for 12 Volt and 24 Volt LED Rope Lights. 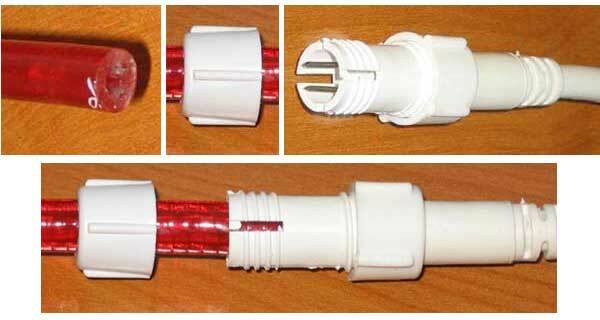 Insert the LED rope lighting into the compression fitting. This inserts the power cords pins into the LED rope lighting to make electrical contact with the wires embedded in the LED rope lighting. Tighten the compression fitting by hand. Then strip the other end of the cord and hard wire to your power source (the 2 prong plug will be removed for use with a 24 volt power source). Before you install your LED rope lights, connect the power and verify illumination. Then as you do your installation, beware of which end you need to feed the power to. LED rope lighting contains diodes that allow the electricity to flow in one direction only. Because of this, when you hook up power to the LED rope lighting, it may not illuminate. If this is the case, disconnect the power and reconnect it to the other end of the LED rope lighting.